In this Aug. 15, 2016, file photo, three of Deepwater Wind's turbines stand in the water off Block Island, Rhode Island. Using federal offshore leases, wind power projects along the East Coast are pressing ahead in 2018, with the goal of transforming the electric grid and providing energy to power millions of homes. A subsidiary of Central Maine Power’s parent company won the right Wednesday to negotiate a contract for what will be the nation’s largest offshore wind project, off the Massachusetts coast. Avangrid Renewables is a 50 percent stakeholder in the “Vineyard Wind” project, which will deliver enough electricity to power more than 400,000 Massachusetts homes. CMP is currently seeking permits for its plan to bring even more electricity to the Bay State, via a transmission line in western Maine, from Hydro Quebec’s massive dam system. 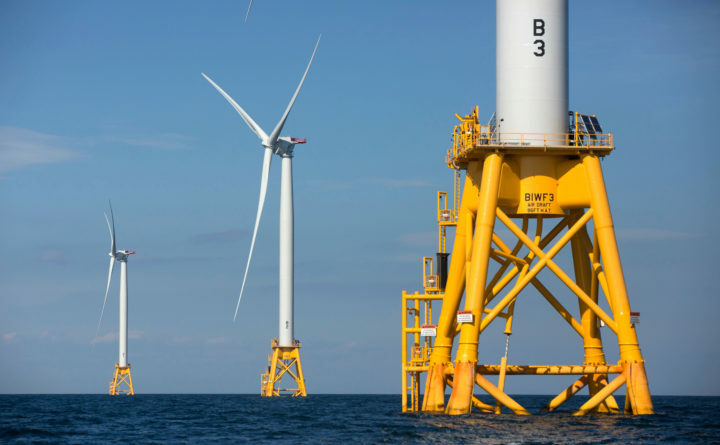 In a background briefing, Massachusetts officials said that project will help ensure a steady electricity supply when the wind is not blowing offshore and reduce reliance on fossil fuel electricity generators.